After visiting Indonesia International Motor Show 2015 (IIMS 2015), I really really want to buy this bike . 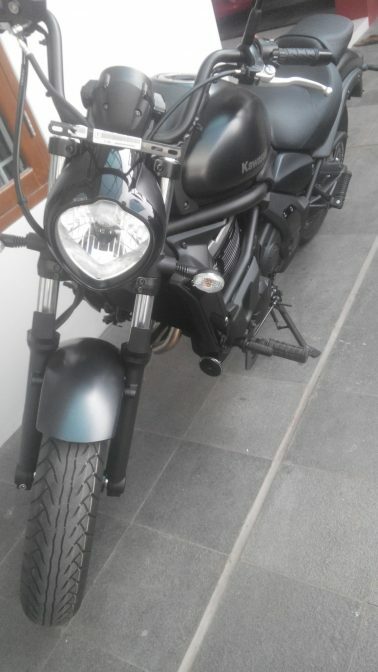 Yes… – Kawasaki Vulcan S 650 – and finally this bike arrived at my home 2 days ago – Alhamdulillah. Actually I was publishing the specification kawasaki vulcan s 650 ABS and price of 2015 in Bahasa at here, but I need to publish in this blog because of personal reason. You know Kawasaki Vulcan S 650 is not like an usual type of cruiser. With double parallel engine, frame and unique suspension layout and Vulcan S 650 appearance of non-traditional, Vulcan S has a genre of its own. I think the designed for riders of non-mainstream, it is unique design, Vulcan S offers a modern and stylish. I got from their official website on here , Feel free to download the Specification Kawasaki Vulcan S 650 cc as on the above link.